Twilight Pest Control are experts in preventing and controlling nuisance and public health pests that enter homes and businesses every day. Whatever pest problem you have, contact Twilight Pest Control for help. There are many pests that invade our homes and businesses but some of the more common ones we come across are Cockroaches, Flies, Spiders and Birds. Although some of these pests are considered a nuisance, pests like Cockroaches and Flies can actually be a real health risk due to their ability to spread disease. Cockroaches are becoming more and more common in the UK, with the German and Oriental species leading the way. They can be a very dangerous pest to have in your home or business as they are known to transfer many diseases and contaminate surfaces and foodstuffs. Most species are rarely seen in the daytime, and are usually found in small gaps and crevices and come out at night to feed. 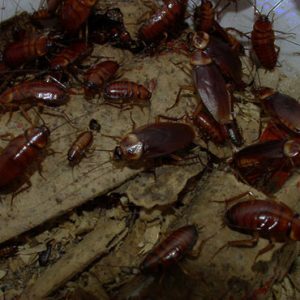 If you have a Cockroach infestation when we would strongly advise you seek help from a professional pest controller as they can be difficult to control. Depending on the situation professionals like Twilight Pest Control, will either employ a spray treatment programme, or use specialist gel baits to solve the issue. There are many types of Fly in the UK, many of which will enter our homes and businesses and be real nuisance, as well as spreading diseases and contaminate foodstuffs. For a business, Flies can be a real issue and possibly lead to a closure of the site or heavy fines for the owner. Although there are thousands of different species of flies, the most common we are asked to deal with are the; Common House Fly, Blow Flies, Lesser House Fly, Cluster Flies and Mosquitoes. All these species of fly are associated with transmitting diseases, and some flies such as Mosquitoes can also be a huge issue, as there bites can be distressing and painful. Twilight Pest Control fully understand each fly species, allowing them to administer the most appropriate treatment to get rid of flies in your business or home effectively. Treatments could include spraying, fogging (ULV), Electronic Fly Killers and Traps. The most appropriate treatment will be determined by the fly species and the environment in which they are invading. Although Spiders around the house can help by catching flies and other insects, they can cause huge distress to many people. In the case of more dangerous Spiders like the False Widow Spider, there is a risk of being bitten, causing serious harm to the recipient. If you are severely scarred by Spiders, and need some help and advice to remove an infestation then please contact Twilight Pest Control. Pigeons, Gulls & Other Pest Birds. These birds will make nests in sheltered such as buildings, bridges, roof spaces, balconies and other structures. They usually gather in large numbers and can be the source of many pest insects such as Mites, Beetles and other pest insects, which come from their nests. Their droppings can be a real public health issue, causing the spread of diseases, and also causing damage to buildings and property. In terms of dealing with these birds there are a number of options including; proofing, culling and deterring. Each and every bird issue is different, so we would always come out and survey the site to determine the most appropriate methods for you. .
Other Pests - Not sure what pest you have? Twilight Pest Control a well established pest control company with fully qualified technicians and experience in all form of pest control. If you’re not sure what pest you have then don’t worry – we offer a free pest ID service and can also provide an onsite survey so we can advise you on your pest and the right treatment method for you. If you’re suffering with any pest in your home or business such as Cockroaches, Flies, Spiders or Birds, then please contact Twilight Pest Control to solve your pest problem.